We met several months before. We both started a ‘mountain glacier hiking’ course. At 60 Mary was the oldest person on the course. She had not signed up as part of a couple nor was she treating the course as a mate-finding opportunity. How refreshing. I soon started to seek-out Mary’s company while hiking and during the rest breaks. I quickly tired of the chattering from other hikers, normally affluent couples considering what gear to purchase, what restaurant to recommend. At 60 Mary’s love for her terminally-ill bed-ridden husband was not stated, but it beamed stronger than a lighthouse. She recorded our hiking sessions, the beautiful scenery and laughter, for him with her new digital camera. He could feel part of an active interesting life because she sought this life out and carefully bought it back to his bedside with love. What a fabulously generous heart. I fell in love with Mary. Not the love that hungers for sexual validation. Not a love that needed to be returned. There was deep peace in her company. 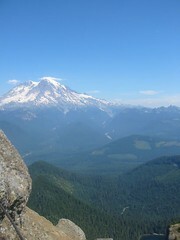 Knowing this I invited myself to her home in the foothills of Mount Ranier. The home she had built with her husband before his death so noticibly stepped towards him. wendy: can I help you gather the leaves from your garden? After a morning gardening, mostly in silence, we went inside and Mary finished the home made french onion soup. She talked while she stirred. Talked of how her father raped her and how the authorities didnt believe her story. Talked of how her sister committed suicide. How she left her bilogical family and built her own new family. How she worked to help abused children and beaten wives. Clearly she has known and seen more loneliness than I could feel. The cedar dappled autumn sun played on her face. No tears, no frown lines. This scribble was published on Tuesday, July 13th, 2010. You can follow any banter on this scribble with the RSS 2.0 feed. You can leave a response, or trackback from your own site. What a powerful and moving post, really good. Check my blog out. You’ve won something. Beautiful. So subtle and perfectly formed. would be special. Beautifully painted for us…thank you. Mr London Street never steers us wwrong. This is a beautiful piece and I suspect I’ll remember Mountain Mary for quite a while. Silences can be wonderful, and her character speaks volumes. Very nice indeed. And kindly-observed. Beautifully written and an inspirational piece. What wonderful encouragement! Thankyou everyone. Welcome to the girl’s who’ve found there way here from Mr. London Street’s reference. Do explore and drop by again, its a welcome change when readers stop to make a comment, my regulars are a loveably lurky lot. Thank you so much for sharing that story with us. I am really touched by it. Title fits so well to it to. Found you through Mr London Street (he paid me to say that).